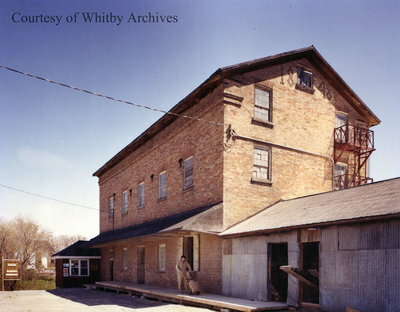 Colour photograph of the flour mills in Brooklin (Whitby). Whitby's Oldest Industry - Built 1848 Flour and feed mill"
Brooklin Flour Mills, ca. 1983, photographer unknown. Whitby Archives photograph D2016_004_019.